When Barcelona meet Real Madrid the biggest subplot is the battle of Lionel Messi vs Cristiano Ronaldo. Ronaldo is the world’s most expensive player, Real having signed him for $131 in the summer of 2009. Prior to that he had been signed by Manchester United from Sporting Lisbon as an 18-year-old. They are two of the highest paid soccer players in the world game. contrast more starkly to that of Ronaldo. The Argentinean left Newell’s Old Boys for Barcelona at the age of 13, with the club paying for treatment on a growth hormone deficiency that threatened to stunt his progress. In 2012 he became the club's record goalscorer at the age of just 24. Each player has won the World Player of the Year award, and has scored in a Champions League final. 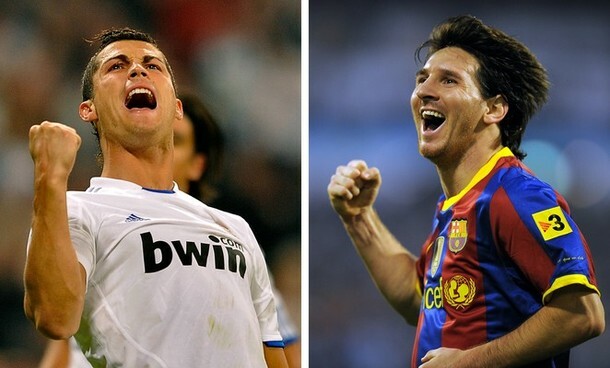 Ronaldo says it is like comparing a "Ferrari with a Porsche", but who is the best? Messi is very much left-footed and finishes most of his chances off on that side. He generally occupied the position on the right side of attack after Josep Guardiola took over as Barcelona coach in 2008, but has featured more centrally as time has gone on. Messi is outstanding in one-on-ones, capable of the subtle dink over an advancing goalkeeper, a curled effort into the corner or a piledriver. So many chances come his way in a team that dominates most games that he will miss a few, but it is hard to find fault in Messi’s finishing. 9/10. Where Messi generally favors brains over braun when faced with the whites of the goalposts,Ronaldo more often than not opts for sheer power. Unlike Messi, the Portuguese star is right footed, but is also adept at finishing on his weaker side. Can be guilty of profligacy, but his goals record speaks for itself. 8/10. Messi memorably scored the second goal against Manchester United in the 2009 Champions league final with his head. But that was the exception to the rule, and most of La Pulga Atomica’s (The Atomic Flea) goals come from his left foot. 6/10. Ronaldo scores far more goals with his head, not afraid to go in where it hurts. At 1.85 meters, Ronaldo is always going to be more effective in the air than Messi, who stands at 1.65. Ronaldo manages to apply great power to his headers and undoubtedly scores higher in this category. 8/10. Messi is capable of producing exquisite set-pieces that bend past opposing goalkeepers. His free-kicks are again more about finesse than brute force. He perhaps lacks the variation of Ronaldo. 8/10. Ronaldo’s swerving free-kicks are a thing of beauty. When playing for Manchester United, he revealed that he uses the technique of striking the ball on the valve to get more power and movement. He is also capable of the classic curling free-kick. 9/10. Messi is the dribbler extraordinaire and there is no one better in the world at taking on and beating players. The beauty of Messi is that it is not just his pace that takes him past defenders, but his sublime technique, quick feet and balance. He is not the strongest or quickest player in the world, but relies on natural ability to take him past his man. 10/10. Few players can perform a step-over like CR9, and it is such skill that helps him beat opponents repeatedly. Ronaldo's control is generally excellent, but he relies more on his pace to take him past players than his Argentinean counterpart. 9/10. Such is Messi’s skill that the ball can appear glued to his feet as he maneuvres himself out of tight situations and finds teammates when it seems he is surrounded. Messi, like Ronaldo, can use the backheel to great effect and also has a penchant for looping the ball over a defender and collecting it on the other side. 10/10. Ronaldo is more of a showman than Messi and can take the breath away with his array of stepovers and flicks. But in some matches, when the stepovers are taking him nowhere and he is attempting backheels that are not finding team-mates, Ronaldo stands accused of producing style over substance. He is blessed with tremendous natural ability and when on song he is a joy to watch, but he has more ineffectual matches than Messi. 9/10. One of the reasons Messi has been more successful at club level than international level is that he dovetails so beautifully with Xavi Hernandez and Andres Iniesta. His chemistry with these two is a beauty to behold and there is no one at Barcelona who claims that Messi does not work hard enough or combine well with his teammates. 9/10. Ronaldo is a player almost beyond reproach but one of the gripes that some teammates have had about him -and certainly sections of the Real Madrid support- is that he can be selfish and too obsessed with making the difference on his own. Ronaldo has been known to shoot from ridiculous angles and distances when teammates are better placed, and will often try to score when there is a superior option to his left or right. Some Real fans have made their frustrations known, and Ronaldo has actually been whistled at the Bernabeu for his individualistic approach. He also has a tendency to show his frustration and petulance towards teammates. 6/10. Messi is not a big man and can be knocked off the ball by more imposing opponents. However, he is also well capable of holding his own in one-on-ones and often it takes a foul for a defender to knock him off the ball. 7/10. Ronaldo is a real specimen of a man and has previously claimed to do 1000 press-ups a day as he looks to maintain his washboard stomach. He is a physically imposing player with unquestionable fitness and professionalism in looking after himself. 9/10. Over the past six seasons, the players’ cumulative goal returns for club and country have been similar. Ronaldo has often been moved higher up the pitch and into a more central position as his career has progressed, while Messi is now commonly deployed by Barcelona in the position he can hurt opponents most: at the centre of the attack. He, like Ronaldo, played deeper earlier in his career but coaches such as Sir Alex Ferguson, Jose Mourinho and Josep Guardiola realize that when you possess a player of the class of either of these two, it is wise to position them where they can do the most damage. 10/10 for both. Messi exerts more influence over more games. Ronaldo has been accused of being a ‘flat track bully’ in the past, effective in the lesser matches but disappearing when it really matters. This may be a harsh assessment, but Messi has produced more performances in the biggest games. The Argentinean scores one more point than the Real Madrid man and edges the battle of Messi vs Ronaldo.